The annual Christian Aid sale returns to Edinburgh’s St Andrew’s and St George’s West Church this Saturday, with a selection of rare and prized items being sold to raise money for the charity. 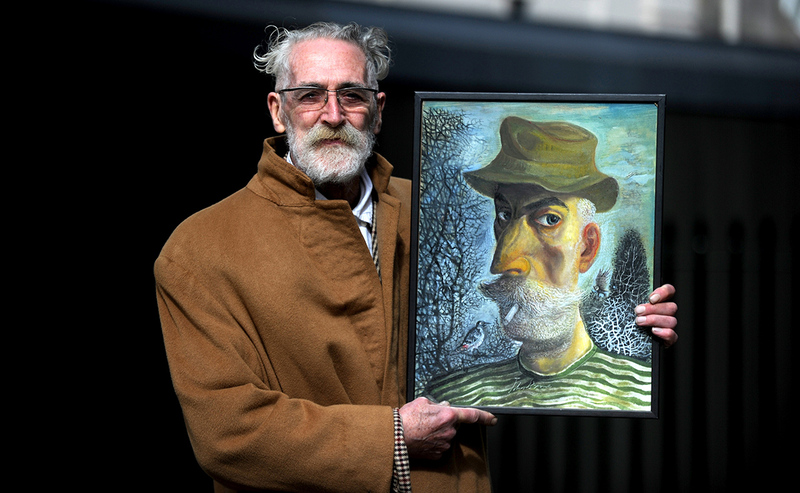 Artist and playwright John Byrne has donated a self portrait for the charity auction. From a hastily-gathered table and a couple of boxes of books set up in the church doorway in 1974, the annual Christian Aid sale is believed to be the biggest charity book sale in Britain and one of the largest in the world. Hundreds of volunteers and experts from as far afield as America and Europe have been keenly sorting and pricing over 60,000 donated books and collectables. Buyers will be queuing around the block from the early hours, eager to find a rare gem. The patron for this year is the great artist and playwright John Byrne. Patrons from previous years have included Ian Rankin, Rt. Rev Rowan Williams, Julia Donaldson, Alexander McCall Smith, AL Kennedy, Liz Lochhead, Dame Elizabeth Blackadder, Aileen Paterson and Alexander Stoddart. John Byrne has generously donated a self-portrait called ‘Self-portrait with a small bird’. Organisers of the sale are inviting sealed bids with the deadline being 10.30am on Saturday 12May, the first morning of the sale. The reserve price is £5,000. Other highlights this year include a signed first edition of Ian Rankin’s first book, ‘Knots and Crosses’ (1987). Another rare find is ‘The Ruined Abbeys of the Border’ (1865) illustrated with six photographs by Wilson and Thompson, both Scottish pioneers of photography; the text is from Howitt’s Ruined Abbeys & Castles of Great Britain. Using photographs as illustrations in books was, at that time, very unusual. Also of interest of collectors will be the complete works of Sir Walter Scott, including the Waverley Novels, Poetry and Prose in a hundred beautifully bound volumes, published in 1844. The Christian Aid Sale takes place from 10am on Saturday 12 May until Friday 18 May at St Andrew’s and St George’s West Church, George Street, Edinburgh. The annual sale of books also includes antiques, ephemera, pictures, records, sheet music and toys, and has raised several million pounds for Christian Aid. To make a bid for the self-portrait by John Byrne please email churchmanager@stagw.org.uk by 10:30am on Saturday 12May.